Rufus & Coco 2in1 Natural Wash is a professionally formulated, pH balanced mild shampoo and conditioner for dogs and cats. First, get your little mate all wet with warm water. Now apply Rufus & Coco's 2in1 Natural Wash to a few different areas of the coat, and massage it in to get a really good lather going. Then simply rinse and towel-dry. Do this whenever they need a wash, and use Rufus & Coco 4in1 Pamper Spray after or between washes for the very best results. Panthenol (Pro Vitamin B5): This plant-derived ingredient acts as a penetrating moisturiser. It coats the hair and seals its surface, lubricates follicles, aids detangling, provides volume, control and makes strands appear shiny. Vitamin E: Acts as an antioxidant that aids circulation. Hydrolyzed Wheat Protein: Helps to strengthen and hydrate hair while increasing manageability gloss, body and lustre. Complete ingredients: Water, Sodium cocoyl Glycinate, Hydrolysed Wheat Protein and Hydrolysed Wheat Starch Complex, Cocamidopropyl Betaine, Lauramide DEA, d-Panthenol, Glycerine, Citric Acid, Perfume, Preservative. Sodium Lauryl Sulfate (SLS): Sulfate is a harsh (caustic) detergent that can damage the outer layer of the skin causing dryness, roughness, scaliness, fissuring, loss of flexibility and reduction of the barrier functions of normal healthy skin. Q: Is 2in1 Natural Wash safe for other animals? 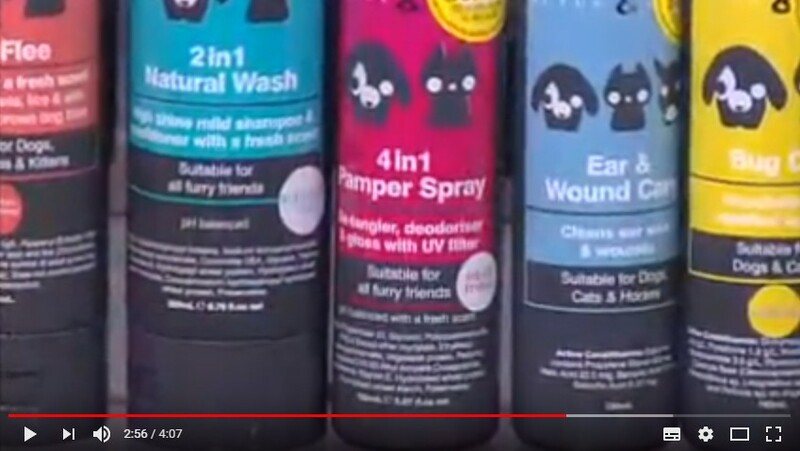 A: 2in1 Natural Wash is very gentle and appropriate for cats, dogs, puppies, kittens, rabbits, mice, ferrets, horses, guinea pigs, rats and hamsters! Q. Is 2in1 Natural Wash safe to use with spot-on flea treatments? A. Yes, Natural Wash is a soap free shampoo, which means it won't strip the treatment from your pet's oil glands. Simply follow the directions on your spot-on treatment's pack on the period of time you must wait before washing your pet. "It's hard to fit a beauty routine into a lifestyle as action-packed as mine. But now with Rufus & Coco's 2in1 Natural Wash, busy pets like me can get the very best wash in no time. My coat's always left looking soft and lustrous, and smells good, too! Now, I hate to ruin it by jumping in a puddle, but..."